Have you noticed the recent trend in using contrasting paint colors within the same room? Homeowners are moving toward designs that combine a clean white wall with a stronger bolder dark brown, red or green color, giving the room a modern look. 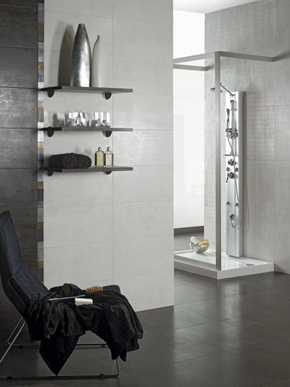 The same results can be achieved with tile – and you can even create a better, more distinctive design. 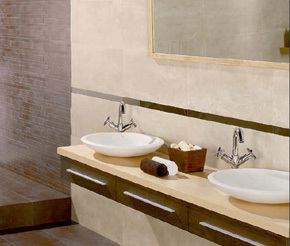 Instead of choosing conventional wall tile colors, why not explore new possibilities? Contrasting wall tile color is the primary design feature in the two photos above and one below. All employ a combination of black and white tile. While two above use a very small and discreet multi-colored trim to separate the black from white, the one below utilizes a bold pattern to define the two distinct tile colors. They all make a dramatic design statement. Not quite ready for a black and white contrast? First think about what kind of impression you hope to make and what kind of effect you want to achieve. Are you looking for peaceful and harmonious or are you trying to achieve bold and modern? 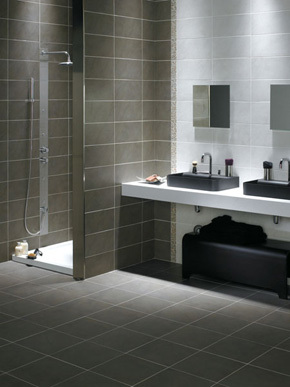 Color contrast with wall tile is a great way to make your room interesting and distinctive. It doesn’t have to be all black and white – in this room, the homeowner featured two light colored wall tiles that achieve a nice contemporary look. 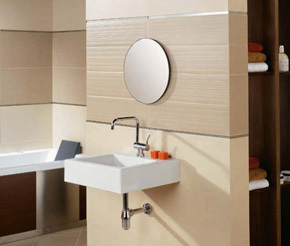 The bathroom is a great place to experiment with different color wall tiles. Functional areas within the bathroom (sink area, shower area, tub area) are clearly delineated and wall tile can help you achieve an interesting look while following a practical logic. While you might not separate a family room wall tile into 2 different colors, it is really easy, even logical to use different colored wall tiles for the bathroom sink area and the shower area, as featured in the design below. Again, you are probably better off using a traditional square format for your flooring tile while using a more rectangular format for your wall tile.